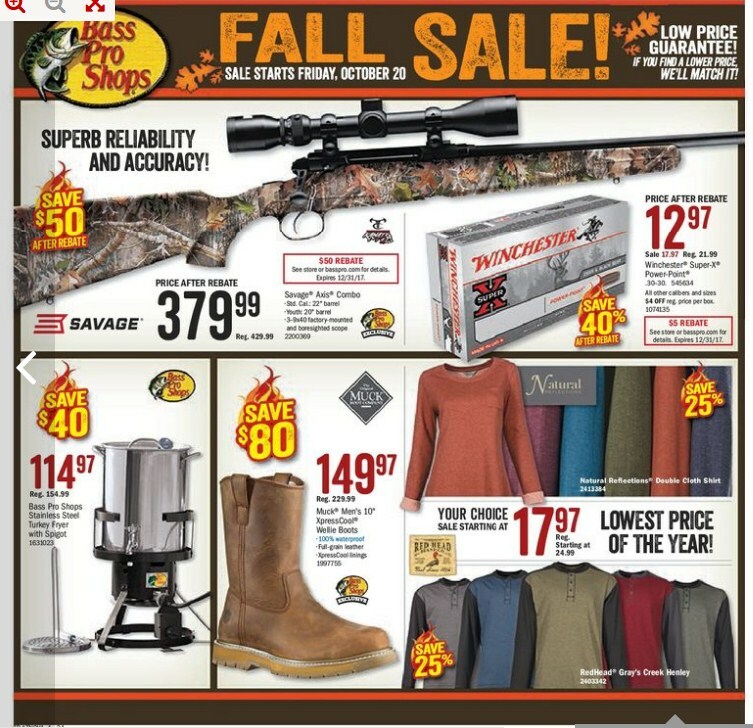 Savage Axis Combo Model : 2200369 $429.99 Regular Price $379.99 Sale Price $50.00 Savings Std,cal 22" barrel. Youth:20" barrel. 3-9 x 40 factory-mounted and boresighted scope. $50.00 rebate see store basspro.com for details. Expires 12 31 17. 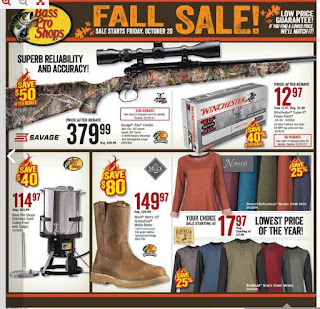 Winchester Super -X Power-Point Model : 545634 $21.99 Regular Price $17.97 Sale Price 40% Savings Price after rebate $12.97. 30-30. All other calibers and sizes $4.00 ofd reg. price box (1074135). 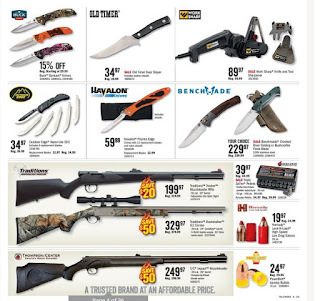 $5.00 rebate see store or basspro.com for details. Expires 12 31 17. Bass Pro Shops Stainless Steel Turkey Fryer With Spigot Model : 1631023 $154.99 Regular Price $114.97 Sale Price $40.00 Savings Versatile, easy to clean, powerful cooker. Muck Men's 10" XpressCool Wellie Boots Model : 1997755 $229.99 Regular Price $149.97 Sale Price $80.00 Savings 100% waterproof. Full-grain leather. Xpresscool linings.Natural Reflections Double Cloth Shirt Model : 2413384 $24.99 Regular Price Starting at $17.97 Sale Price 25% Savings Left chest pocket. RedHead Gray's Creek Henley Model : 2403342 $24.99 Regular Price Starting at $17.97 Sale Price 25% Savings Soft and comfortable. Winchester Model 94 Carbine Model : 2292389 $1399.99 Regular Price $1299.97 Sale Price $100.00 Savings 30-30 win. 20" barrel. 7-rd black walnut blued. Marlin 336W Rifle Model : 1791627 $579.99 Sale Price 30-30. 20" barrel. Youth model (1791627). Marlin 336SS Model : 944949 $819.99 Sale Price Combining Marlin's popular 336 lever action centerfire rifle design with an eye catching stainless steel look. 2-Gun RedHead Rugged Vinyl Gun Case Model : 2031309 $109.99 Regular Price $89.97 Sale Price Full-length piano hinge. Rubberized non-silp nandles. Firearms shown ae not included. RedHead Rigid Vinyl 2-Pistol Case Model : 2031327 $42.99 Regular Price $34.97 Sale Price Case features full-length piano hinge with nylon support hinges plus rubberized non-slip handles. Halo 1000 Angle Laser Rangefinder Model : 292980 $219.99 Regular Price $179.97 Sale Price $40.00 Savings Range;1,000 uds. RangeMaxx Ammo Can Model : 1923291 $12.99 Regular Price $9.97 Sale Price 20% Savings Ammo not included. BoreSnake Viper Bore Cleaner Model : 1705813 $21.99 Regular Price $17.97 Sale Price Includes 3 brushes instead of 2, for 50% more scouring power, plus an extra lubrication one at the end of the snake (orange section). Available for pistol, rifle, or shot gun. 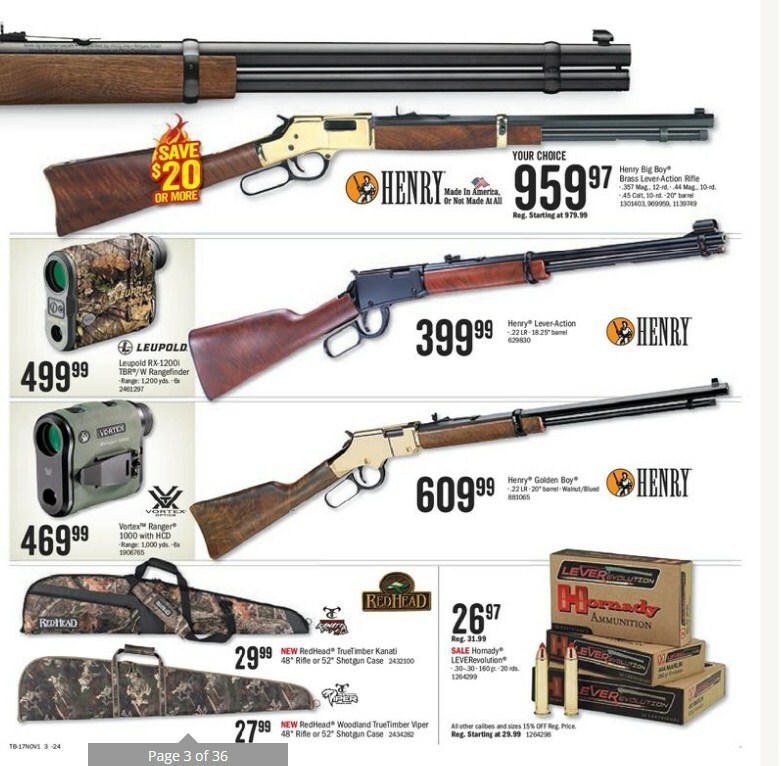 Primos G3 Trigger Stick Bass Pro Shops flyer Gun Rests - Tall Monopod $99.99 Sale Price Adjusts from 33" -65".Henry Big Boy Brass Lever-Action Rifle Model : 1301403,969959,1139749 Starting at $979.99 Regular Price $959.97 Sale Price $20.00 Savings Made in America or not made at all. 357 mag., 12-rd, 44 mag., 10-rd. 45 colt, 10-rd, 20" barrel. Leupold RX-1200i TBR With Rangefinder Model : 2461297 $499.99 Sale Price RAnge; 1,200 yde., ex. 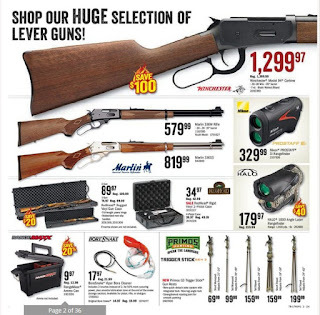 Henry Lever-Action Model : 629830 $399.99 Sale Price 22 LR-18.25" barrel. Vortex Range 1000 With HCD Model : 1906765 $469.99 Sale Price Range: 1,000 yds. 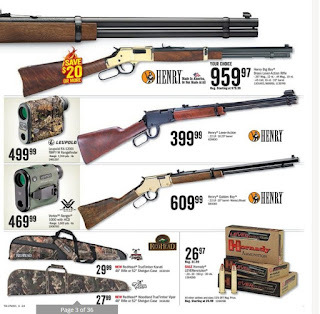 6 x .
Henry Golden Boy Model : 881065 $609.99 Sale Price 22 LR. 20" barrel-walnut blued.